Our project seeks to help and support asylum seekers and refugees in and around Wolverhampton, and encouraged the City of Wolverhampton to make a public commitment to becoming a place of welcome and safety by adopting the title of ‘City of Sanctuary’. Membership of W’ton CofS includes current and former asylum seekers, agencies working with asylum seekers and refugees, representatives of local community and faith organisations, and individuals supporting our aims. We are a registered charity - no 1176101. Visit our frequently-updated diary page on our website for events and activities and for useful local information. Useful information can be found in the downloads section of this page. Please also follow us on Facebook. (If not answered, please wait for the answerphone to ask you to leave a message). 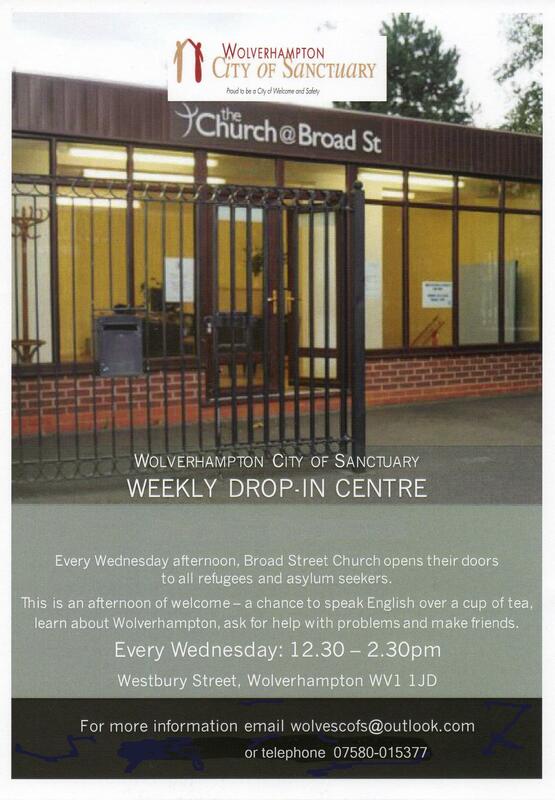 Weekly Drop-In Centre at the Church in Broad Street, every Wednesday from 12:30 to 2:30 p.m. Among other things, we aim to provide a safe, welcoming place where asylum seekers and refugees can relax by socialising, playing games and informally mixing with people from their own and other cultures. Every Wednesday from 12:30 to 2:30 p.m.